Men in Black sightings: Do they still happen? Do UFO Hunters Still Report “Men in Black” Sightings? Saeed Adyani – © 2011 Columbia Pictures Industries, Inc. 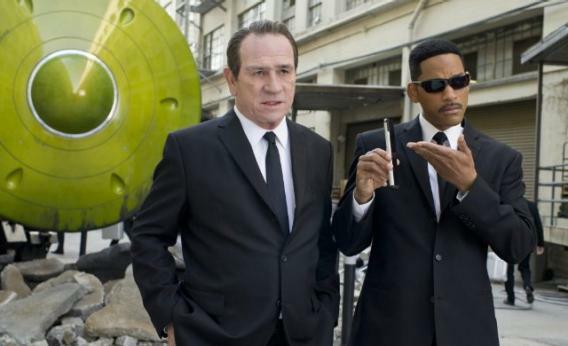 This weekend, Will Smith and Tommy Lee Jones will attempt to conquer the box office yet again with the third installment of the Men in Black franchise. The films, centered on a secret group of dark-suited agents responsible for keeping alien life from the eyes of the public, are based on Lowell Cunningham’s comic book series of the same name. That comic book series was in turn inspired by actual reports of clandestine, black-clad figures, reports that date back several decades and are an integral part of UFO folklore. This got us thinking: Given the enormous commercial success of the Men in Black films—as well as the popularity of TV’s The X-Files, which also drew on “men in black” mythology—do UFO seekers still report such sightings? Or has the mainstreaming of this phenomenon rooted it out of the UFO subculture that produced it? First, a little background. In the summer of 1947, the sighting of “nine shiny discs” by a private pilot named Kenneth Arnold inspired similar accounts around the globe, as eminent ufologist Jerome Clark explains in his detailed book, The UFO Encyclopedia. (The Arnold sighting led to the coining of a new term: “flying saucers.”) That same summer, Harold Dahl claimed to have been visited by a man in a dark suit who promised to harm him if he disclosed his sighting of unidentified flying objects around Tacoma, Wash., the previous day. Dubbed the “Maury Island Mystery,” the incident was later investigated by the Air Force, and is widely regarded as a hoax. But the image took hold in the popular imagination, and accounts of men in dark suits who have some connection to UFOs proliferated. The most famous such account came from Albert K. Bender, who, in 1952, created the International Flying Saucer Bureau. Soon afterward, he said, he was visited by three men in dark suits who threatened him with imprisonment if he continued his inquiries into UFOs. Bender’s account was featured in They Knew Too Much About Flying Saucers, a book by IFSB associate Gray Barker, who also mentioned it frequently in his magazine, The Saucerian. I asked Clark, an active board member of the J. Allen Hynek Center for UFO Studies (CUFOS), whether the popularization of the MIB has affected the number of visits reported today. Such accounts have tapered significantly in the 15 years since the original MIB was released, he said, but he does not believe the films are responsible. Why the decline, then? Clark didn’t offer a specific reason, but he did suggest that few ufologists pay attention to such matters anymore, particularly since Keel passed away in 2009. British ufologist Nick Redfern, on the other hand, disputes the notion that sightings have declined. In his book The Real Men in Black, he tells of several reported visits in recent years.